If a top-secret, classified blueprint that details the step-by-step means for a factory to successfully enter MotoGP exists, then surely it has found its way into the hands of bosses at KTM, the premier class' latest manufacturer to enter its ranks. At the heart of this document lies a simple formula: to get a relatively new machine up to speed, surround it by reams of expertise. Then add two riders of proven top-six quality - Pol Esaprgaro and Bradley Smith - on top and watch that gap to the leaders shrink. Could anyone have honestly expected Espargaro to lap within 1.3 seconds of the best MotoGP has to offer at any of the tests, especially when considering his ideal time at that particular test was three tenths quicker than his personal best? That the RC16 isn't a million miles away in terms of speed, and can run lap times consistently, speaks volumes of how far this project has come in the past twelve months. Impressive, but when observed from up close hardly surprising. Judging by the thoroughness, resourcefulness and enthusiasm on show, KTM - hailing from Mattighofen in the rolling Alpine hills, and financed by Red Bull's millions - doesn't give the impression its ambitions are limited to scoring points, or even breaching the top ten. One only needs to listen to company CEO Stefan Pierer speaking in public to understand this drive is derived from the very top. "It's my dream to win a MotoGP championship," came an early declaration last August. Not one to dodge controversy, Pierer also labelled Honda KTM's "most hated competitor" in front of a worldwide audience. Bold, and the ambition can't be faulted. But when you consider the marque's success in other competitive fields, you can understand its origin. Be it the Paris-Dakar, American Supercross or Moto3, KTM has succeeded in most fields it has entered, a defining factor for Smith and Espargaro when signing on for two years. Bradley Smith in action in Qatar. pic: Gold&Goose. That commitment has manifested itself in acquiring expertise, and in high numbers too. Both riders spoke enthusiastically of the sheer volume of heads nodding attentively, listening to and analysing their feedback during and after test sessions. Having the resources to make parts when you please is one thing. But ably interpreting rider feedback and correctly translating is quite another. What a coup it was for the factory to secure the services of Mike Leitner, long time crew chief at Repsol Honda, to fill the position of team manager. Having spent a considerable amount of time in the paddock, the Austrian knew a host of names capable of filling the vacancies in the garage to carry this out. Furthermore, KTM is retaining a two-rider test team, led by grand prix veteran Mika Kallio, to aid the development process. "What I've seen over these first three tests has just been phenomenal," says Smith. "If we have justification, if we have good data, they will build. And they will build between now and the first race if they have to." Of the effort expended by the 38-man MotoGP team, he added, "Honestly, I would put them at the top with someone like Honda." Espargaro's crew chief Paul Trevathan also detailed some of the methods of the factory's fairly unique working methods with regards to new parts. "If you say to Pit [Beirer, KTM's Motorsports Director], we really need this,' he is able to pick up the phone and a decision is made there and then and we 'go'. There isn't a set of meetings to understand that. The whole company is behind it 100% and that's why I'm sure we'll get there." On the second day of testing at Phillip Island, Espargaro quipped he might not have time to test all the parts KTM brought to test, such was the pile on new components, sitting in the back of the garage. At Sepang, among other things, three chassis were available to test. For two riders frustrated by the dearth of technical progress inside a satellite team in recent years, this has been a great motivator. For all its openness to the press, bosses have acted ruthlessly when needed. The pinching of Marco Bertolatti - effectively the number two in Aprilia's own burgeoning project - at the close of '16 acted as a real slap in the face for the Noale factory. It is believed Bertolatti will focus on in-house development, freeing up Leitner to manage the team's needs across a race weekend. Pol Espargaro cresting Lukey Heights at Phillip Island. He ended the test just 1.3s off the fastest lap. pic: Gold&Goose. So what of the RC16? Espargaro and Smith quickly set about revising the electronics settings from the get-go at Valencia. Dialling in mapping, traction control, engine braking settings and the like has taken considerable time at new tracks. A race weekend doesn't afford a rider three eight-hour sessions to get it right. As such, Smith is already anticipating long weekends in Argentina and Austin, where free practice sessions amounting to 165 minutes of track time might not be sufficient to get things right. No doubting it, there will be weekends early on when its riders are fighting at the back of the field. Along with steel chassis and WP suspension, the RC16 houses the only 'screamer' engine configuration on the grid. Rear traction has been a constant issue since Valencia, and an updated motor brought to the Qatar test brought no real solution. Heading into the season, applying power to tarmac in a smooth, linear way remains a priority, as does overall top speed. The required riding style is quite different too, as Espargaro explained in Sepang. "It's a bike that, when you push more, the lap time comes. It needs to be ridden wild. But even like that you get really tired. You have to hold it with the body [and] this is so physical." There has been progress with electronics since then, however. A fifth chassis of the preseason was a definite upgrade on what had gone before. "I followed a couple of guys and our chassis seems good," commented Smith on the final night in Qatar. "It seems to be doing the right things at the right time." Crucially, both riders have largely given similar feedback across the winter, forging a clear direction for the development team. Don't believe for a minute that this is a two-year experiment, a brief dabbing of the toes in water. 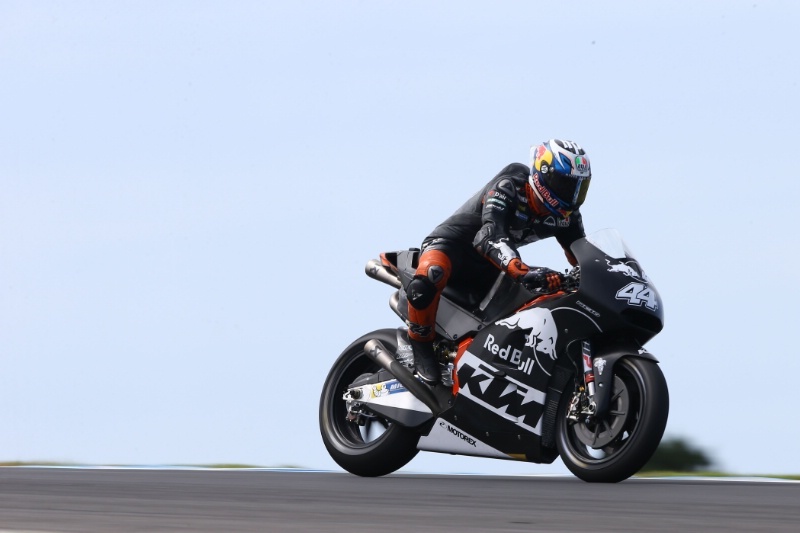 KTM aims to establish itself as a MotoGP player, as demonstrated by its entry to Moto2 in 2017, which bridges a gap between the junior category and the very top. Previously young talent, fostered through the Red Bull Rookies programme, then Moto3, had slipped from its grasp. Now a full programme is in place. A 15-year old with sufficient talent can benefit from KTM's expertise all the way through to the very highest level. 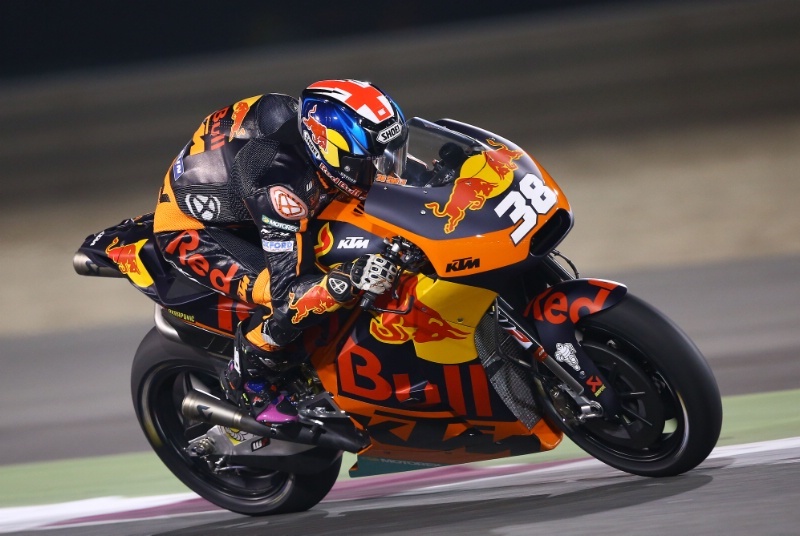 It is believed, for example, that Brad Binder has an option to graduate to MotoGP in 2019, should his performances across two seasons in Moto2 warrant it. And it isn't just the factory that is looking long-term. Smith is fully aware this is a two-year project. "I'm thinking the long game on this one," he says. "We're a lot closer than I thought we were going to be. OK, we're sat at the bottom. But we're sat at the bottom super close to boys that have been here for two or three years on machines that are tried and tested around a place like this." For Smith to be aiming for a point scoring finish at round one - the machine's second ever race - is indicative of KTM's approach. Don't expect them to be running at the back for long.